Environmental activist and former vice-president Al Gore has re-emerged in the climate change “debate” with a scathing attack on climate change deniers and the Obama administration’s lack of action on the environment. And when one looks at the Obama administration’s actions so far, there does seem to be much merit to Gore’s argument. Obama’s 2011 State of the Union address seemed to skirt issues of climate change altogether and he has done very little to defend research made by scientific bodies inside the United States. However, I’m not sure that I can solely blame Obama for this inaction. After all, I do believe that Obama legitimately wants to promote environmental policies and reduce human impacts on the environment. Unfortunately his hands seem to be tied by the political realities of the American political system. American politics (to me) seems hugely ideological and divided along partisan lines. It seems that Republicans refuse to play ball on many issues and vote against important bills simply to block Obama. And when you have Democrats not even agreeing on certain issues you arrive at a situation where accomplishing real action on the environment seems impossible. For instance, the Democrat-controlled Senate overturned the passage of a global warming bill in 2009 which would have set the first ever limits on air pollution. My theory is that the media’s basis as a form of entertainment allows these “debates” to persist. Let’s face it, controversy is a form of entertainment, and the media recognizes and exploits this. Facts are for university students, scientific publications, and professors in their ivory towers. In order to make the public interested in something, the media feels the need to present two opposing sides in conflict with one another. Anyways, I suppose I should bring this post (and extended rant?) to a close here. I guess I just find it frustrating when I observe the willingness of the public to accept the presence of a debate on climate change when in fact the debate has been orchestrated by vested-interests utilizing various forms of rhetoric and pseudo-science to make their position appealing. I don’t really have any viable solutions to the aforementioned problems. However, I do gain optimism when I see inspiring action coming from countries such as Germany leading the way on renewable technology, countries such as China investing in solar power, global corporate leaders such as Google investing in clean technology, and grassroots movements from around the world. But will the actions of these leaders be enough to avert irreversible climate change? 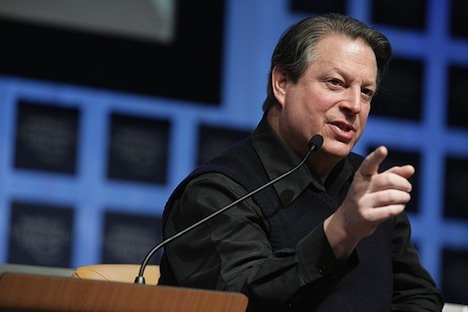 Image CC licensed by World Economic Forum: Al Gore.